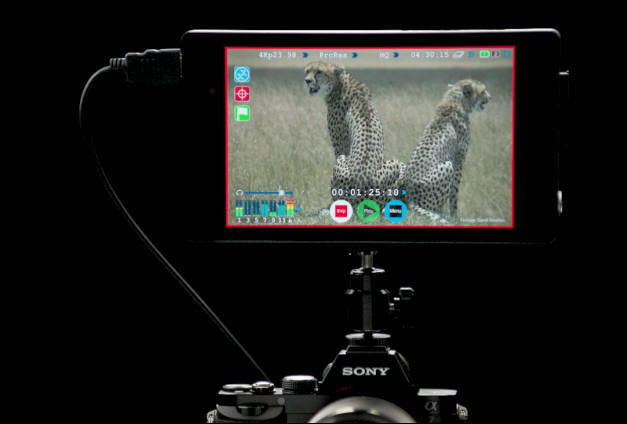 Atomos, the creator of the award-winning Apple ProRes Ninja and Samurai camera-mounted recorders, and the pocket-sized Connect converters, will show the brand new 4K "Shogun 7” IPS monitor/recorder alongside the new Sony A7S at NAB 2014. The Shogun is currently the only 4K HDMI recording solution that can take full advantage of the new A7S’s full 35mm ultra-sensitive 12 mega pixel video sensor, clean HDMI out, 120 fps HD and custom HDMI timecode and start/stop trigger. ”Finally the camera the world has been waiting for, Sony has pulled out all the stops to deliver the world’s first Full Frame Video sensor in a camera for the masses.” said Jeromy Young, CEO and Founder of Atomos. “We are very proud to give 4K recording capability to the Sony A7S with our brand new 4K ProRes Shogun which sports a 1920×1200 7” killer monitor and unparalleled affordable 4K recording”. The Atomos Shogun is the world’s first 4K HDMI and 12G SDI monitor recorder and deck. With clean HDMI out direct to 4K ProRes onto single SSDs or RAIDed HDDs – 4K is now a mainstream reality at the equivalent of $40 per hour for storage media. With Sony’s pedigree and reliability coupled with Atomos’ revolutionary feature set and price points, this combination at under $5K is the most compelling video solution on the market today. Like the Samurai and Ninja Blade, Shogun allows the recording of pristine, 422 10-bit images straight from thecamera sensor captured using 4K/HD ProRes, Uncompressed RAW Cinema DNG or Avid DNxHD codecs.Waveform and monitor assist tools such as luma parade, vectorscope and tri-level focus peaking offer a very comprehensive test and shot setup tool kit. Launch presentation and Q&A on day one of the show to be held at 12.30pm on the Atomos booth C9532. The Atomos Shogun is slated for shipping end of Q3 beginning Q4 2014 for under $2000 USD and will be available through the Atomos Worldwide reseller network. 4k in general, or the GH4 with 4k? Otherwise it can be only recorder. Is this about the 4k sony with 40000+ ISO? "The Shogun is a 7″ IPS monitor backed with recording capability. It is the only 4K HDMI recording solution that can take advantage of the A7S’s 4K signal, 120fps HD output and custom HDMI timecode with start / stop trigger. The Shogun also has 12G SDI ports and will record 4K ProRes onto single SSDs or RAID. The recorder will be priced under $2k. The Shogun also allows uncompressed raw Cinema DNG capture, although I believe this is over HD-SDI only. The release date for this recorder is not until end of Q3 / Q4 2014, so potentially GH4 and A7S owners could have a while to wait for glorious 4K over HDMI." I saw the photo. It is nothing super special, I think. If you want you can make separate topic for it, or use NAB topic. Looks good and shows the way the industry is going. Gawd. 2tb for 2.5hrs of 4k pro res! Wouldn't an IPB codec strike a better balance on file size? That's nuts. Here's the problem. The current 4k prores codec is 4444 I believe, and produces massive file sizes. What I'd like is a 10bit 422 4k flavour, but apparently that's not appearing anytime soon. I think with hindsight we'll end up seeing the relatively small footprint of 4k recorded internally on the GH4 as a blessing - and they've still left the 10bit 422 door open whenever someone comes up with a codec that makes sense. Hope they add cinema 4k recording for the gh4. 400GB per 1/2 hour is unreasonably large. The BMCC is bad enough to deal with, this is insane. Does anyone know why the file size is so large. Are they encoding 4:4:4 or something. The Atomos site says it's 4:2:2, just these file sizes do not compute... Will DNxHD be just as large? @arknox Those types of numbers are referring to Cinema DNG 4k. The BMCC 2.5k raw images are 5MB per frame. With 4k being about 2.3x larger, it would be 11.5MB per frame. 11.5x24fps = 276MB per second. 276*60 seconds = 16GB per minute. 16GBx30 minutes = 485GB...definitely a very large workflow. However, they say that the Cinema DNG is compressed, but not sure how much yet. I wonder if the two-drive caddy uses RAID1 or RAID0? Meaning, is it 2.5hrs of 4K ProRes per 1TB, or 2TB?